John Albert Axel Gibson was born in Brighton, England on 24th August 1916 and moved to New Zealand in 1920. He was educated in Auckland and New Plymouth Boys High School. In late 1937 Gibson applied for an RAF short service commission and, after provisional acceptance, sailed for the UK on 7th April 1938 in the RMS Rangitata. He began his flying training at 4 E&RFTS Brough on 16th May 1938 and on 9th July he went to No. 1 RAF Depot Uxbridge for an induction course. He moved on to 3 FTS South Cerney on 23rd July for intermediate and advanced training. With the course completed, he was posted to No. 1 AACU at Farnborough. He later served with ‘C’ Flight, No. 1 AACU which moved from Weston Zoyland to Penrhos on 4th December 1939. On this day Gibson was attached to 9 Air Observer School. He was posted to No. 1 RAF Depot at Uxbridge on 20th May 1940 for onward movement to France. 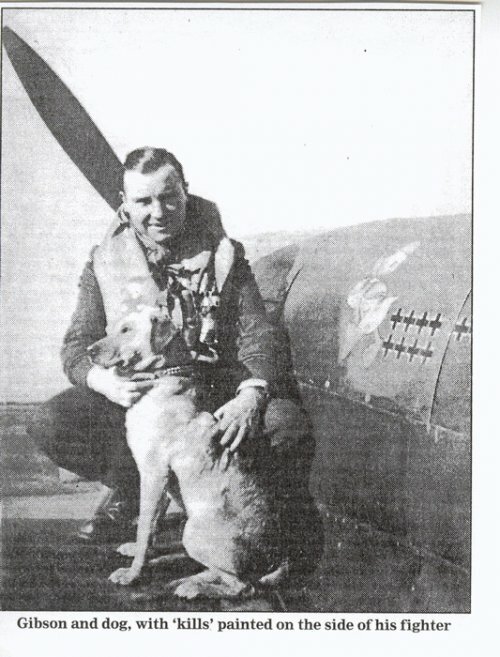 Gibson joined 501 Squadron at Anglure on 21st May. He destroyed a He111 and shared a second on 27th May, during which action he was himself shot down, crash-landing in a field near Rouen and having to abandon his Hurricane. On the 29th he got a probable He111, on the 30th shot down a He111 and damaged another, on 4th June damaged another and on the 5th probably destroyed a He111 and damaged another. On the 10th Gibson destroyed a Me109 but was himself shot down and baled out near Le Mans. His final success in France was a Me109, possibly shot down on the 14th. 501 Squadron was withdrawn from France on 18th June, operated from Jersey on the 19th and re-assembled at Croydon on 21st June. Gibson claimed a He111 damaged on 9th July, a Do17 destroyed on the 13th, a Ju87 destroyed and another damaged on the 29th and a Do17 damaged on the 31st. He destroyed a Ju87, damaged another and destroyed a Me109 on 12th August. 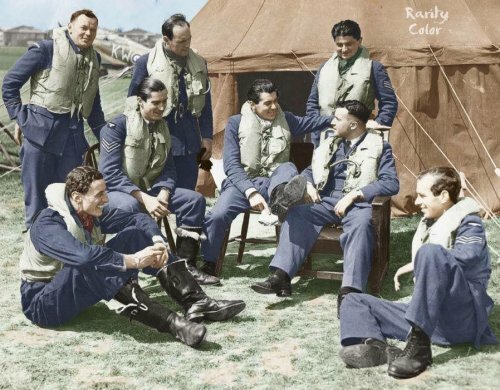 When he landed back at Hawkinge, Gibson ran his Hurricane, P2986, into a bomb crater. On the 15th he shot down a Ju87 and damaged another. In this action, Gibson’s Hurricane, P3582, was set alight by return fire. He steered it away from Folkestone, bringing it down to 1000 feet before baling out. On 24th August Gibson destroyed a Ju88. On 25th August he was appointed ‘A’ Flight Commander and promoted to Acting Flight Lieutenant next day. On the 28th he damaged a Me109 and on the 29th he shot down a Me109. In this combat he was again set on fire and baled out of Hurricane P3102 over the sea, two miles offshore, and was picked up by a motor boat. Gibson was awarded the DFC (gazetted 30th August 1940). He damaged a Do17 on 2nd September, shot down a Me109 on the 6th and damaged another on the 7th. His last operational sortie with 501 was on 23rd September. The following day he evidently became ill and was admitted to Princess Marys RAF Hospital at Halton. He was posted away from 501 on 2nd October 1940. 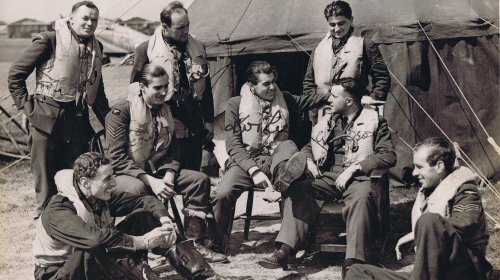 501 Squadron that appear within pic and including George Stoney who was shot down and killed three days later. It was taken during the late afternoon of the 15th August 1940 at ‘B’ Flight dispersal at RAF Hawkinge. The back story of the photograph is that John ‘Gibo’ Gibson had just arrived back at the airfield having been shot down from return fire from a Junkers Ju 87B (that itself crashed into 78, 80 and 82 Shorncliffe Crescent, Folkestone). ‘Gibo’s’ aircraft was set on fire and he was heading for a built up area of Folkestone. The only problem was he had recently bought a new pair of shoes and knew if he baled out he would no doubt lose them. Steering his burning aircraft away from Folkestone, ‘Gibo’ took off his shoes, tied them together, slipped a Officers Card, with his name on, into one of the shoes. He throw his shoes out before baling out safely. His Hurricane smashing to earth at Alkham. On ‘Gibo’s’ return to RAF Hawkinge he was promptly reunited with his shoes that had been already found by a witness of the action. The photograph shows Kenneth ‘Hawkeye’ Lee taking the ‘p’ out of ‘Gibo’ for risking his life to save his shoes. Hawkeye is seen pointing to his shoes in this photograph. Both ‘Gibo’ and ‘Hawkeye’ were very close friends of myself through the last twenty and thirty years of their lives.